A magnetic photo jigsaw puzzle of your family is a great gift! A personalised magnetic puzzle with your selected image on it will be something special for your family, in addition of course, you will have a great time solving the puzzle together. Our magnetic photo puzzles have magnetic surfaces, which allow you to put the puzzle on the refrigerator or any other metallic surface. That way, you can see your special image every day. Simply select a puzzle size and upload your picture to make a magnetic jigsaw puzzle! Jigsaw puzzle that sticks to any metallic surface! A personalised magnetic picture puzzle is just like a standard jigsaw puzzle, the only difference is that we add a magnetic surface to the back of the puzzle, so you can stick it to any metallic surface. Magnetic puzzles are quite a new concept in the picture puzzle market, and because they are made with your chosen photo and you can select from 6 different puzzle sizes, magnetic jigsaw puzzles at PuzzlesPrint are completely customisable. You can upload your own photo and even add text to the magnetic puzzle. A magnetic jigsaw puzzle will be a great gift for kids, offering a more interesting experience than a standard personalised jigsaw puzzle as it will stick to any metallic surface. You can put your magnetic picture puzzle on a refrigerator door for example, so you will remember the photo that is on the puzzle every time you open your fridge. Magnetic puzzles are not only new concept of traditional picture puzzle but also a new concept of fridge magnets. If you are planning to create a personalised magnetic puzzle as a gift you can be sure that the recipient will enjoy the magnetic puzzle and the way that it is presented to them. PuzzlesPrint will deliver a custom made magnetic puzzle to your desired address, it can be yours or you can send your magnetic puzzle directly to the recipient as a gift. 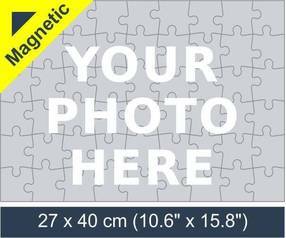 We will pack your magnetic puzzle in an unassembled way in a plastic zip lock bag, which we will put inside in a custom made puzzle box which has your selected photo on it the front.